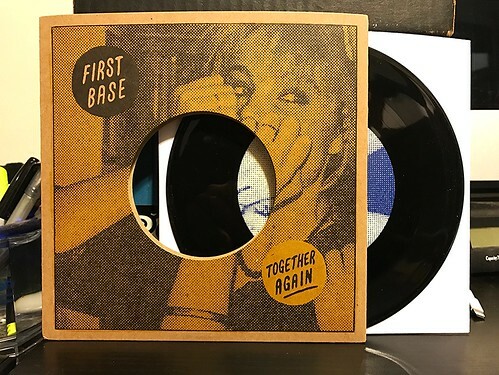 I Buy Way Too Many Records Dot Com: First Base - Together Again 7"
This is the seventh and last of the 7"s that I bought as a bundle from La-Ti-Da records. There have been way more good than bad and I would buy another bundle like this without hesitation. The best part has been discovering some new bands and the last 7" in this set, by First Base, is one of the best. The funny thing is, I actually thought I had a record by First Base. Either I'm confusing them with another band that I can't remember or I've somehow lost a record of theirs. It's probably the former, though I have misplaced the occasional album. Regardless, this La-Ti-Da 7" is a corker. Both songs are tightly wound, harmony soaked, power pop gems. With the bouncy bass lines you want and the singalong backing vocals that you need. This is a band that looks to have a bunch of records out, including an LP on HoZac and a couple releases on Hosehead (which is for sure why I know the name of the band at the very least). You can bet I'm going to be checking out those records soon, this 7" is fantastic.